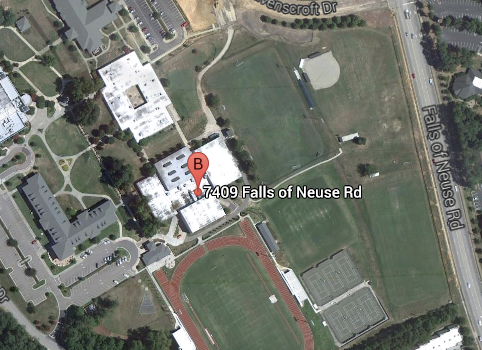 The Google Apps in Education North Carolina Summit will be held at Ravenscroft on October 19 & 20, 2013. Ravenscroft's tree-lined 125-acre campus is nestled in the heart of North Raleigh. Our extraordinary facilities include: dedicated library for Lower School; Middle and Upper School Library & Technology Center; Fine Arts Center with a a gallery, a 460-seat theatre and a 200-seat flexible performance space; 13 science labs; a 350-seat Dining Hall; and a Health Center. Ravenscroft's Athletic department offers 23 sports (boys and girls), and fields 53 teams in those sports at the Middle School, junior varsity, and varsity levels. More than 80 percent of Ravenscroft students in grades 7-12 participate in School-sponsored athletics. Raleigh-Durham International Airport has nearly 400 flights on eight major airlines to nearly 40 non-stop destinations each day. A block of room (20) has been set aside for Thursday (10/17), Friday (10/18), and Saturday (10/19) at the special rate of $119.00/night. Guests may also call 800.HILTONS and inform the reservations agent they would like to book a sleeping room utilizing the special rate code RAV. Raleigh's Official Tourism site. This website includes restaurants, events, and sites not to be missed in Raleigh. Certificates of Participation for the general conference will be available after the conference. Graduate credit is available from Adams State College. Registration is available here. 1hr for $55. Please use a credit card to register. Contact Christine Archer with EdTechTeam with any questions.